I could tell of our trip to watch team steer roping at the Tom Cox Arena in Mayer, Arizona, as a ‘shaggy dog’ story. And I shall. 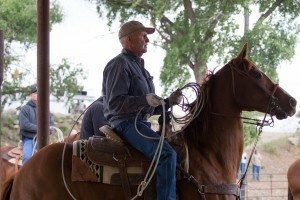 But it’s a tease to get you to look at my new 39-photo gallery, Team Roping. I’m inserting samples here. It all started our first night, April 19, in Wickenburg, AZ, when our waitress at the Ranchero Restaurant (great home-made Mexican) told us about her family’s roping horses. We knew nothing of the sport. 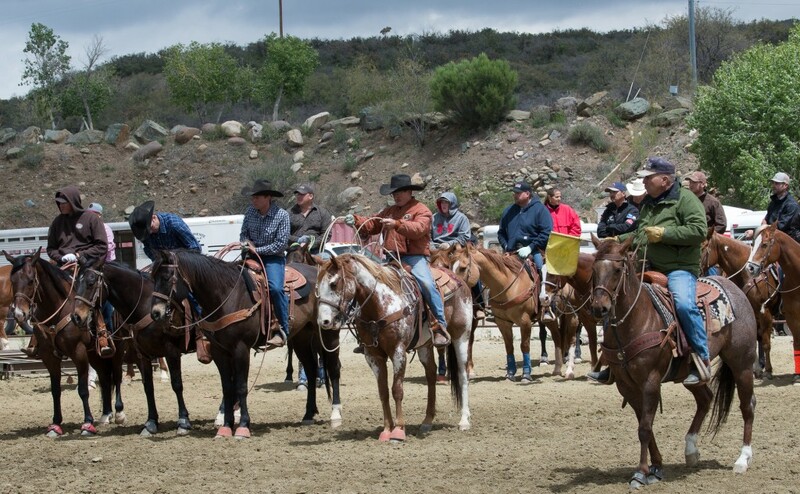 Unfortunately, the season had ended that afternoon in Wickenburg – the sport’s capital. The Ranchero is so good we went back the next night. We told our waitress about an interesting visit to a saddlery. She said, ‘Oh, you must mean Ben’s Saddlery.’ Actually, we didn’t. So we went there the next afternoon. Ben’s is a fairly large town shop with used saddles, riding gear and boots taking up the front two thirds of the floor. A remarkable case of antique equipment is worth a long look. The back is given over to a workshop producing fine leather gear. For someone who grew up in tack rooms, the smell of the leather was delicious, nearly ecstatic. Nice people work there. They were willing to explain what they did. A few days later, the weather had turned cold (really! in late April!!). I went back to Ben’s for a sweatshirt. I asked about places I should see and, judging my clothes, got directed to what proved to be a suburban Phoenix town of malls. How about roping? With some persuading, I was handed a xerox of an ad for a roping event the next day in Mayer, AZ, about 50 miles away. Half the distance proved to be due east through flat desert punctuated by Seguaro cactus. At I-17, we turned north toward Flagstaff. Abruptly the road rises and passes through mountains. The views west and north are spectacular, even on a flat gray day. The many semis and SUVs make the twisty rising road … interesting. But the vistas! We found Mayer on a dusty, stark, stony plateau. The gray-white skies and cold west wind did not soften the vistas. The Tom Cox Arena is on a dusty track running off Arizona 69, set in a ravine and covering, maybe, six acres. A small open cast mine lies about a third of a mile away. Horse vans of varying sizes were parked wherever the ground was flat. Ours was one of perhaps four cars. On a sunny, hot day, the horses and friends and family of the ropers would need the protection of the large cottonwoods in the ravine. This day, boys in fleeces played among them. 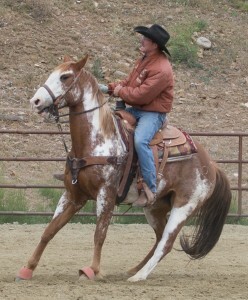 Of course, I’d expected western horses, a type apart from one Quarter Horse I knew mainly from a distance. They didn’t disappoint. None showed a trace of the Thoroughbred crosses that have polluted the old working strain. With only two exceptions, these were descendants of the blocky horses everyone except Gene Autry rode in his westerns sixty years ago. All ranged between 14.2 hands and 16, with almost all in the middle of that range. Each horse bore a brand. Their well-groomed coats seemed to bring out the sign. They looked prized. They were dead fit. They moved easily. They didn’t make mistakes. They stood calmly in line awaiting their next runs. For one more familiar with racehorses and three-day eventers, they seemed Stepford calm. That impression dies when they’re called to action. 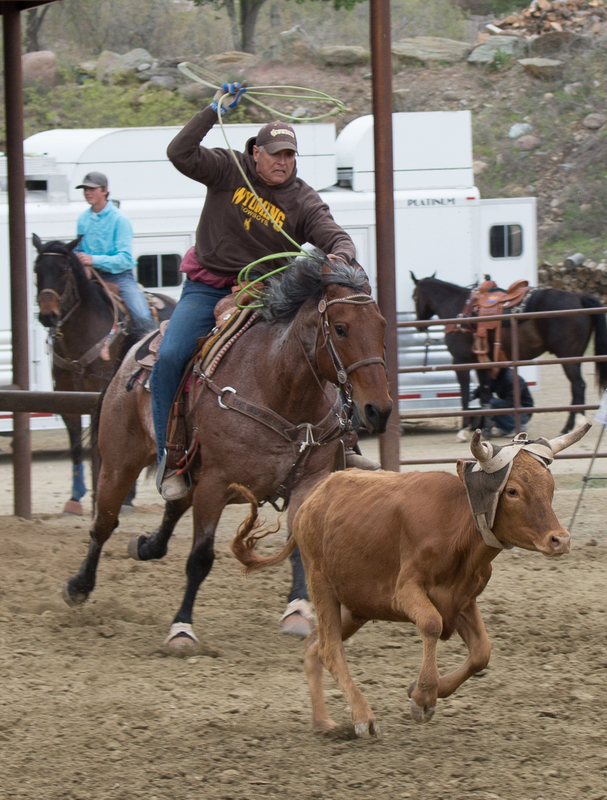 In team roping, the header (to the steer’s left) tries to get a lasso over the horns. 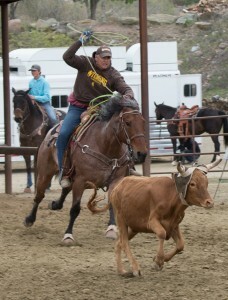 The heeler then gets a rope over the steer’s hind legs. The steer is immobilised between the two horses. This race against the clock takes 13-16 seconds. That is, in the 20 percent of runs that are successful. On most, the judge’s yellow flag remains upright, signaling ‘no time’. Each run had its interest. The ropers ranged in age from mid-teens to mid-sixties. Two women were among the 15-20 teams. There is an intimacy with the competitors who are only 20 to 30 feet from the fence where the few spectators gather. No helmets shield the riders faces. 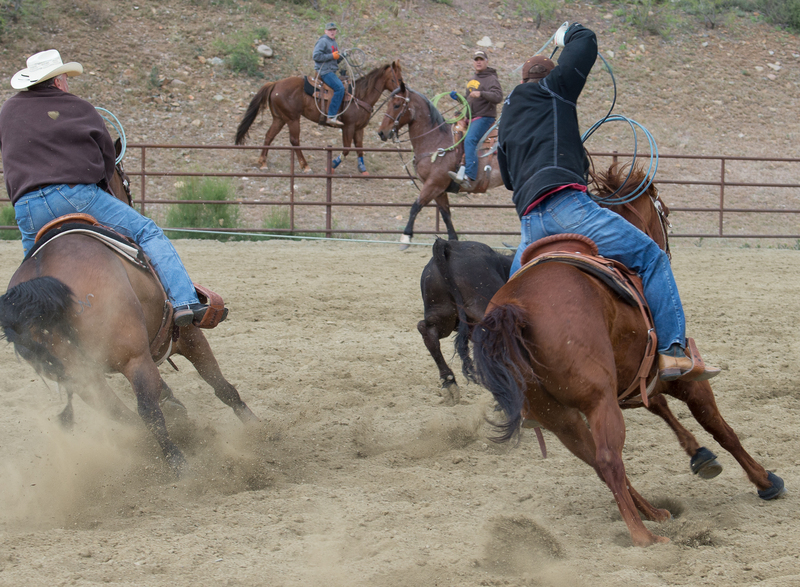 Regardless of age, the ropers are highly skilled. Managing a 1000-1200 pound sprinting horse while circling a 500 pound steer’s horns or hoofs with a stiff 30 foot rope is a feat. It sure as hell doesn’t look easy. And, I’ve done enough with horses that I’m certain it’s much harder than these practised riders made it look. As engrossing as the runs are, the demeanor of the riders I found fascinating. They were as calm, workman-like as their horses. In our age of fist bumps and (over) celebration of routine scores, these riders – fail or succeed – showed no emotion. There was no jawing at the judge or the timekeeper. Only an occasional cheer came from the scattered spectators. Few places I’ve been, whether ten time zones east or sixteen west, are as foreign to me as central Arizona. The desert, the arid uplands, the unfamiliar vegetation, the sheer expanse. Georgia O’Keefe knew what she painted. And, the way of life…. Yet, even fewer have been as welcoming, as accepting of the inquisitive tourist. It was fun to return that evening to the Ranchero and share our adventure. Our waitress, her husband and their three sons were branding cattle the next day. Next Post Pistol Pete Reiser’s Dings: A Story for Today.